Praises is the solo project of Canada’s Jesse Crowe, who is currently on tour across Europe with Dumb Angel supporting her upcoming album “In This Year: Ten of Swords”. 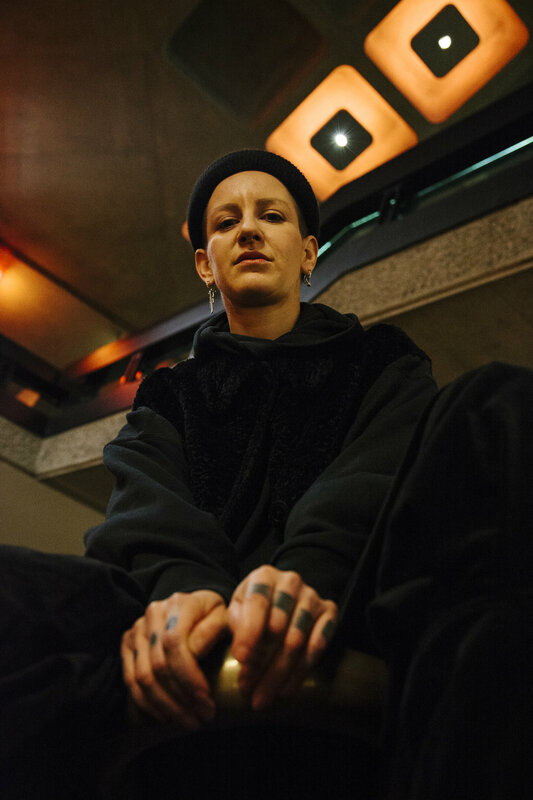 ASBO magazine caught up with Jesse for the first preview of the new music video for “C to C” - and to discuss the new record, life on tour, and the decline of artistic spaces both in Toronto and London. So the title of the new record is ‘In This Year: Ten of Swords’, and it came about from a tarot reading on New Years going into 2017. Myself and my partner at the time, we were really looking forward to the new year and feeling very hopeful and fresh, and we each did a tarot reading for each other. There was an overriding card that was supposed to represent your entire year and mine was the Ten of Swords, which generally is – I mean no card’s a bad card – but it generally represents anxiety and the weight of these swords coming down on you. So I just laughed as he drew a Three of Swords which is a much more powerful and easy going card. It solidly did represent what the year brought, and writing all these songs within that year it felt like it summed everything up. Wow. Does that translate through the entire album conceptually then? I think it does. So I wrote a track about this person called ‘Three of Swords’ and it was about this funny game we played called… I forget exactly what it was called, but I think it was called the Cube Game. You’re asked to picture a cube, and you’re asked to then picture a horse beside the cube. You then picture an environment that the cube’s in, and you’re asked to picture a ladder. I don’t remember specifically what everything represented – but he pictured a floating cube that you couldn’t get to and a horse running away, and I don’t remember what the ladder was doing but the weather was awful. The horse was representing our relationship and the cube was representing accessibility to yourself, all those kind of things. So I wrote this song based around that tarot card, and him talking essentially about running away from someone which ended up being, uh – me, haha. So yeah that card and the tarot theme kind of runs through, but not necessarily but what those two cards represented in each other, if that makes sense? That’s an in–depth metaphor. Having listened to the record it seems much more electronic than the previous two EPs, is that connected to the themes on the album or was it a natural progression? I think it was a little bit more natural. It was based around some restrictions I had in the way that I was writing and recording – I took on a new space in a warehouse and in that space there was a piano. I decided I was going to use what I had and I was going to try to record an entire record and produce it as much as I could alone. So one of the tools I had was the piano, I had Ableton, I had a few synths and that kind of thing, and so it became electronic because I didn’t have a band any more and I wanted to do everything myself. And then I started falling in love with those sounds and what could be created by looping a piano, or taking these natural instruments and making them have an electronic feel. It was less about being like – oh, I feel like being an electronic artist now, and more about being like – oh, well I don’t have any natural drums, so I’m either gonna use the drum machine or I’m gonna play a drum pad and that kind of thing. Then a lot of the rhythmic elements came later when I went into the studio with my former Beliefs bandmate, Josh (Josh Korody), or I guess current bandmate but that band’s kinda on hiatus. He’s a huge modular synth guy, and so he heard all the songs and as we were mixing he was like, do you mind if I slide in a bit of modular on these? And he started working with modular rhythms and trip hop samples and that kind of thing that lended itself to sounding like a massive tech record. I guess it was the Josh influence with only having Ableton and no band that created an electronic feeling record. Has Praises always been a solo thing? Praises has always been my band or solo project. And then people have come in and out as like a full band or a duo, or sometimes I’ll play under that name just entirely solo. When did you start Praises? Praises started not too, too long after Beliefs, so maybe about 6 years ago. It started with me just writing more personal songs on guitar that wouldn’t fit in with Beliefs, or were too personal to be in a band. And then it kind of transformed into just me doing everything by myself. It’s always been the thing that just exists, it comes in and out of focus. You’ve been touring Europe, how has that been so far? Touring DIY is always an interesting way to go. It’s been really fun, and we’ve been touring with our very good friends Dumb Angel, so there’s been a nice balance having two duos touring together. But it’s tough. It’s financially straining, you never know what you’re gonna get when you show up when you’re doing things yourself. But I think it’s been really, really, really fun, and every day's been its own interesting challenge. You’ve played quite a few dates specifically within the UK too, how’s the UK treated you? The UK’s been interesting. Our first show in Manchester we played for a university film crew who wanted to test out doing live recordings and live shows. So we’ll probably get some phenomenal footage, however there wasn’t really an audience – our audience was basically this group of people who had to be there. And it’s really interesting to try to give your full performance when you’re just in front of people who are stationary with cameras, rather than a captivated, paying audience. So Manchester was really funny, we loved it there though. The bar we played at, I think it was the Peer Hat, was awesome and we had a really good time. And then we went to Nottingham and played at Chameleon Arts Cafe, and it was just a very sweet small show – it sounded incredible. I would say anyone looking to play Nottingham play there, it sounded so, so good. It was a really nice vibe for a show, everyone was there for you guys! Yeah! I’d rather play in front of 20 people who were actually there for the performance, than in front of a hundred people who could care less that you’re there. You mentioned Beliefs are on hiatus – what’s the story behind them, you mentioned it’s a duo? It’s a duo for the most part, but live we end up needing somewhere between 4 and 6 people depending on the record. Beliefs started when I met Josh at our friend Pat’s birthday party, and Pat ended up being our Bass player. We found out that we both really loved Shoegaze stuff – My Bloody Valentine, Slowdive, we were like – ah let’s make a Shoegaze band, no–one’s doing that! And seven years ago there wasn’t as big of a Shoegaze revival, so people were really excited about it. We ended up being one of those, you know, three guitars with forty–thousand pedals, and you can’t hear the vocals and we’ll blow you out of the room, style Shoegaze bands. We made two records like that and then ended up making a way more electronic sound for our third record, which really led into what I was doing with Praises too. So it’s been about 7 years, and we’ve been on this record label Hand Drawn Dracula the whole time, which Praises is also on, who are a huge help – but for the most part touring and stuff like that ends up being very DIY, and I think a big part of why Beliefs doesn’t exist any more in a live setting is that touring was too financially and emotionally stressful for us to continue. So Hand Drawn Dracula are Toronto based? Yep, they’re Toronto based. They’re this really awesome independent label that give us a lot of freedom. They notoriously put out really excellent records. I guess they don’t have that kind of label expectation where they’re like: you have to go out 6 months a year and you have to make sure you sell, sell, sell. They’re very much like: well we’d like to make our money back and hopefully you make good art. Location seems to play a lot in your music too. You live in Toronto and are from Saskatoon, in what way does the geographical background inspire how you make art and what art you make? I think that Toronto played a huge part in making this record because I was in this building that was due to be torn down, and now it’s gone. So even just knowing that these last artistic spaces that we had was not going to be there any more made it so that I was making a record in this small amount of time, and trying to really connect with the space. And the city is just pushing everyone out, I mean much like London but of course on a smaller scale, it’s becoming really expensive and the arts and creatives are being pushed out. So I think that always seeps into the music, just feeling like you don’t fit in in your city any more. That’s definitely the same story for London, I feel like it’s most of the western world at this point. Totally. And then most of the artists move to another city and ruin it. I don’t know what we’re gonna do next year. It’s kind of a funny thing, because this tour was self–financed, I feel like I have to take a bit of a breather to just make the money back to be able to tour again. For anyone out there who thinks that musicians make a bunch of money on tour, if you’re independent – you probably don’t. I have an EP that is mostly done that I’ve recorded and mixed myself. I’ll probably end up taking it to Josh to mix and do some more rhythmic work on. It’s getting more and more electronic because I didn’t even have a piano at that point. I’ve now just recently moved into a new space where I have a piano and a Rhodes and that kind of thing, so I guess my next goal is to write a more organic follow up record, and maybe integrate Mike (Michael J Boyd) who I play with live into doing more of the guitar stuff with me and more of the piano stuff as well. And I’d like to tour a bunch next year, I just don’t know what the plan is. I guess do a record release show in Toronto, and then start booking likely Europe and the UK again because I’m trying to avoid the USA. You were mentioning you’d like to play Bristol next time? Totally, just a full Bristol only tour, a Bristol residency maybe? Maybe just try to find Portishead and hang out, haha. That’s my only goal! Praises’ new album “In This Year: Ten of Swords” is out December 7th 2018, and is currently available for pre–order through Hand Drawn Dracula’s Bandcamp. This article features in the upcoming print edition of ASBO magazine.